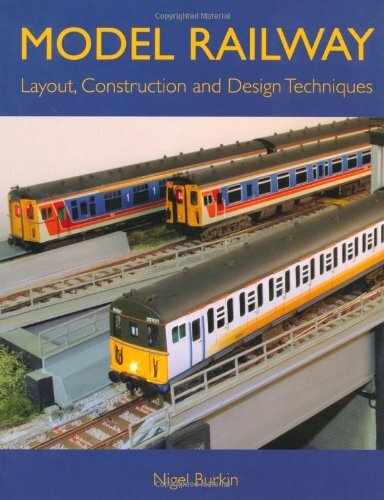 The book takes the reader on a journey with Nigel Burkin as he builds his own layout projects. Model Railway Layout Construction and Design Techniques chronicles the construction of his N scale ‘Montana Rail Link’ North American layout, his British prototype 4mm EM gauge ‘Folkestone East, layout and his American HO scheme, which are all housed together in a 18′ x18’ layout cabin at Nigel’s home in the Scottish Highlands. Model Railway Layout Construction and Design Techniques has certainly become a firm favourite already. It is very well written and because it is based on Nigel’s own journey from ideas, through planning and into construction, it is very readable. Nigel Burkin’s scheme is on three levels combining lots of different construction techniques. Naturally there is a huge wealth of information on baseboard construction (or benchwork) for permanent and portable layouts, shelf layouts and a whole lot on deck design using helix between levels. I remember reading Nigel’s original article about building the helix in one of the UK monthly modelling magazines a few years ago. The book is full of very good colour photographs all explained in great detail. If you just had the money to buy one book on design and construction then this would be the one I would choose and highly recommend to others, it’s for all scales, all types and all budgets. Nigel’s book is a revelation in this field and I would also certainly consider other books by him in the future if they are all to this quality of writing and presentation. Nigel Burkin is a life-long modeller with interest in British outline modelling and North American Prototypes including The BNSF Railway and Montana Rail Link. He is a published author, editor and photographer with hundreds of magazine articles to his name. This is his second book for Crowood, following the highly praised A Practical Introduction to Digital Command for Railway Modellers.